Hey, pals! 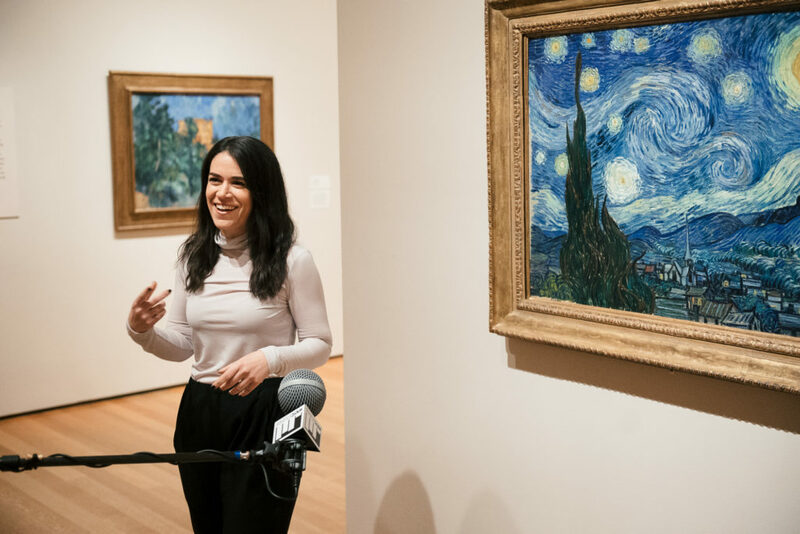 In the first episode of her new podcast, A Piece of Work, Broad City creator and star Abbi Jacobson tells a delightful story of one of her earliest experiences with the Museum of Modern Art in New York, or MoMA. With a newly minted degree from the Maryland Institute College of Art, Jacobson moved to New York City in hopes of becoming an illustrator. But like so many art school grads, Jacobson struggled to make ends meet. To supplement her income, she started a greeting card company called Imagine That (to this day, she says, the company name still haunts her). One day, she slipped a couple of her creations into the rack of cards at the MoMA museum store. She figured maybe someone would pick one up, take it to the counter to pay and she’d get discovered. Obviously, that didn’t work out. But Jacobson found fame and fortune elsewhere. Though she never stopped loving art. And she never stop creating — her book of illustrations, Carry This Book is very entertaining. In A Piece of Work, Jacobson and a bunch of her famous friends like Tavi Gevinson, Questlove and RuPaul wander through MoMA learning about some of the museum’s thornier works. It’s a great primer on the museum’s collection. Tell Me More Stuff To Check Out! The Stoop — Today in the U.S., conversations about race and ethnicity are taking center stage. But those can be hard talks to have. Leila Day and Hana Baba are trying to make them easier. Their new show, The Stoop, is a “dialogue about the diaspora,” tackling touchy topics within the black community — afrocentrism, “sounding white” and the differences between being black and being African. Conversations With People Who Hate Me — YouTube provocateur Dylan Marron gets a lot of hate online for his work. Rather than sit at home and sulk about it, Marron decided to confront his internet bullies and turn their conversations into a podcast. With the show, Marron says he’s trying to practice radical empathy to truly understand the people who are trolling him. Are You Sleeping — This debut suspense novel from Kathleen Barber about a true crime podcast gets its inspiration from the first season of Serial. In the book, podcast host Poppy Parnell re-investigates a murder that had supposedly been solved years ago. In doing so, she subjects the victim’s family to scrutiny and stress, raising questions about whether the toll the podcast investigation takes is worth it. Do you have a podcast recommendation you’d like to share with us? We want to hear it! Give us a jingle on the Pod Line at 202-885-POD1 and leave a message. Then we’ll put you on the radio and gosh, won’t that be a blast!